Welcome to Axios World, where two evenings a week we break down what you need to know about the big stories from around the globe. I'm filing this week from the beautiful city of Montevideo, Uruguay. 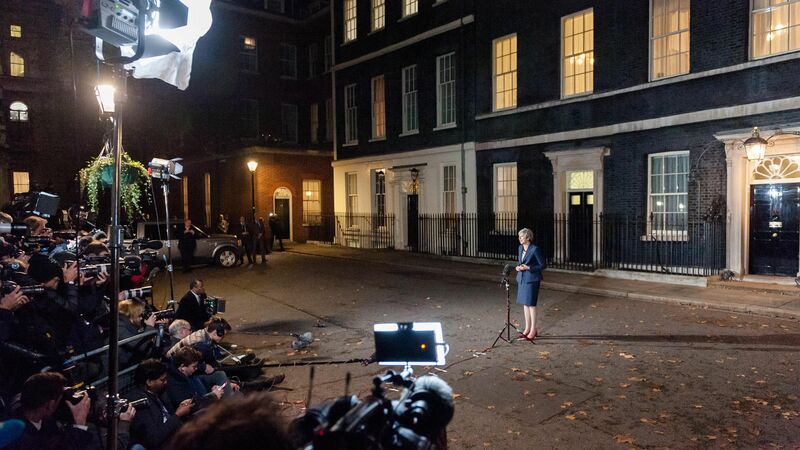 As members of her Conservative Party submitted letters of no confidence and senior figures from every faction of British politics denounced her Brexit deal, Prime Minister Theresa May set a clear line: She won’t relinquish her post unless it's taken from her. Where things stand: May must stare down a rebellion in her party just to secure the opportunity to present a deal that has every chance of failure in Parliament. If she fails, no one really knows what comes next. That's an explosive report — not only that the U.S. would consider expelling Gulen, who has been living in self-imposed exile in Pennsylvania for almost two decades, but that they would do so to remove pressure on the Saudis even as the kingdom has failed to put forth a credible explanation for Khashoggi's death. It suggests the White House's priority, come what may, is to protect the Saudis and Crown Prince Mohammed bin Salman. Per NBC, Erdogan saw an opportunity after Khashoggi's murder to reissue a longstanding demand — that Gulen be extradited back to Turkey. "Trump administration officials last month asked federal law enforcement agencies to examine legal ways of removing" Gulen, NBC reports, adding that "career officials at the agencies pushed back on the White House requests." U.S. agencies declined to comment to NBC. The big picture: Turkey has arrested hundreds of people for alleged links to Gulen. That was one of the charges against Andrew Brunson, the U.S. pastor who was at the center of a diplomatic crisis between the U.S. and Turkey until his release in October. Columbia University historian Adam Tooze has written books about two seismic events with major anniversaries this year: the end of World War I, a century ago last week, and the 2008 financial crisis. Tooze argued this week at Brookings that the U.S. played a decisive role in the war and, by retreating from the world stage once it was over, in setting the world on course for another cataclysm decades later. At the time, he argues, the U.S. was not prepared to take on the role of global power. When it comes to the financial crisis, though, he says the Federal Reserve and the Bush and Obama administrations played a crucial and under-appreciated role in stabilizing Europe and limiting the damage, massively inflating the Fed's balance sheets in the process. "Rather than undermining U.S. power," he says, "2008 actually reasserted U.S. power and the role of the U.S. as a financial hegemon." That reality was never fully reckoned with either in the U.S. and in Europe, he argues. The big question: If financial disaster struck again, would the U.S. be willing to play that same role? Tooze points out that the 1916 presidential contest, fought over America's role in WWI, was the first American election that felt crucial to much of the world. Now, the foreign policies of allies and foes alike hinge on how Americans vote, even in the midterms. The countries that have invested most heavily in their relationships with Trump — Russia, Saudi Arabia, the UAE and Israel — might have to start hedging their bets by endearing themselves to the Democrats. Doing so could be challenging given how profoundly Democrats resent what they see as hard-sought alignment with an unfit leader. For leaders negotiating with Trump — the EU and China on trade, North Korea on its nuclear program — prospects of an abbreviated-term, one-term, or otherwise weakened president could prompt them to drive a harder bargain. Countries targeted by the U.S. — mainly Iran — could also decide to wait Trump out. The bottom line: After adjusting to an unpredictable president, world leaders now must figure out how to deal with a weakened and wounded one. A geopolitical contest is playing out in one of the world’s least developed countries — Papua New Guinea (PNG). In this case, geopolitical competition, often the source of war and strife, may be a force for good, writes GZERO Media's Gabe Lipton in the latest Signal newsletter. What's happening: Leaders from 20 countries will arrive in the island nation this weekend for the start of the annual APEC summit. Xi Jinping has already arrived — he's making the first ever official state visit by a Chinese president. Xi is expected to come bearing gifts, including much-needed aid for the region’s poorest nation. His visit is part of a broader push to expand Chinese influence in the South Pacific, which has seen Beijing dish out over $1.3 billion in loans since 2011. In recent days, Australia launched an investment fund to counter China’s regional economic diplomacy. It also signed an agreement with PNG to develop a shared naval base that would allow Australia to extend its military reach. But the relationship has been marred by Australia’s use of a remote PNG island to house migrants who it refuses to grant asylum. What to watch: If PNG Prime Minster Peter O’Neill plays his cards right, the country could cash in by balancing the competing interests of China and Australia. The World Bank has withdrawn a $300 million loan intended for education in Tanzania, citing the country's policy of banning pregnant girls from school. The big picture: The decision comes with Tanzania, as the Economist puts it, "on the descent from patchy democracy towards slapdash dictatorship." "Barely a week passes without brazen displays of arbitrary power" from President John Magufuli. "Opposition members of parliament who refuse to accept bribes (the going rate is 60m shillings, or $26,200) to cross the aisle and join ... the ruling party are arrested. ... Last year Tundu Lissu, an MP, was shot and injured outside his home." "Tanzania, the third-largest aid recipient in sub-Saharan Africa, has been a darling of donors since the 1990s, when it seemed to be consolidating its democracy and also reducing poverty. Now, after a decade or so during which freedoms began to flourish, Tanzanians are facing both economic hardship and repression." "Emmanuel Macron suggests building its own army to protect Europe against the U.S., China and Russia. But it was Germany in World Wars One & Two - How did that work out for France? They were starting to learn German in Paris before the U.S. came along. Pay for NATO or not!" Thanks for joining me — see you Monday evening!